Jean Menetrey Edwards, 95, passed away with her family by her side on Jan. 25, 2019 at Cambridge Manor in Fairfield. Jean Edwards, 95, passed away on Jan. 25. At her request, there will be no wake or funeral. She was born in Waterbury to Frank and Olive Woosley Menetrey. She was a direct descendant of Louis DuBois, a Huguenot settler & “patentee” of New Paltz, NY in 1678. Jean’s grandparents remembered family members coming down the Hudson River with barge loads of Rosendale hydraulic cement for construction of the piers of the Brooklyn Bridge. Jean’s mother, who studied nursing at Vassar Brothers Hospital, was a public health nurse at the Henry Street Settlement in New York City, which pioneered public health issues at the beginning of the 20th century. 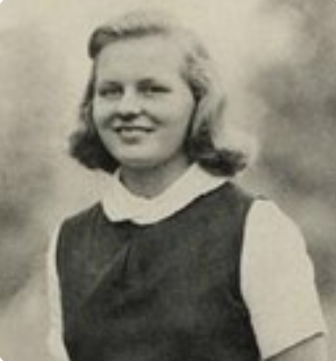 Jean was a graduate of St. Margaret’s (now Chase Collegiate) School in Waterbury and the Rhode Island School of Design in Providence, Rhode Island. Jean started out in sales and and window dressing at M. A. Green’s in Waterbury. She also worked in Hoagland’s in Greenwich, Spector’s in Trumbull and created and ran a gift department at the Darien Sport Shop. She lived in the Huntington Center area of Shelton from 1957 to 1987, where she was known for her potter’s wheel and kiln, as well as her Citroen 2CV. Jean was predeceased by her sister, Joan Menetrey Lynch. She is survived by two daughters: Sarah (Bert) Hellgren and Beth Edwards; and a son, Sten Edwards; and a beloved grandson, Daniel Ramirez- Edwards. Jean requested no calling hours or service. To sign the online register, please visit the funeral home website.